2016 ‘X Factor’ winner Isaiah Firebrace has just been named as Australia’s entry for the 2017 Eurovision Song Contest. The singer has made no secret of his Eurovision ambitions in various interviews, including with us (HERE) towards the end of last year. “Ever since Guy was on it a couple of years ago – and Jess did it as well – I’ve been dreaming a lot of going, because it’s such a massive thing,” he told us in the chat. Those dreams will now come true; his single ‘Don’t Come Easy’ immediately serviced to Australian media in the wake of the Eurovision announcement. The track is co-penned by the DNA boys (David Musumeci and Anthony Egizii) in Sydney, the same pair responsible for Dami’s 2016 single ‘Sound Of Silence’, along with Michael Angelo. 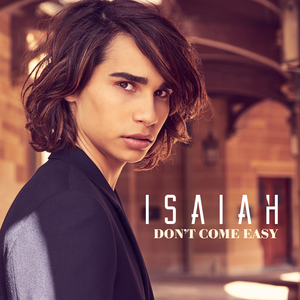 “I’m so proud to be representing Australia as our entrant for the Eurovision Song Contest 2017,” Isaiah said in a statement. “Even though it has been a dream of mine, never did I think for one minute it would be a possibility. To be able to share this news with my family and friends is unbelievable. Isaiah will compete in the first of the semi finals – on Tuesday May 09 – in the hope of progressing through to the Grand Final on Saturday May 13.